We simply cannot say enough wonderful things about Bear Trap Dunes. Natalie and I were grateful to have had the opportunity to work with Carrie Baker and her top-notch team. Because we were from New Jersey, we was nervous that it was going to be difficult to coordinate all that needed to be coordinated for our dream Delaware wedding, but thanks to everyone at Bear Trap Dunes, we soon realized that it was as easy as pie! Everyone involved with our wedding were extremely professional and provided quality customer service. They went above and beyond the call of duty were able to successfully help us with creating a memorable wedding ceremony and reception. The Bear Trap Dunes team helped us customize the dinner for our wedding, including an amazing four course meal. The menu included fall inspired dishes, such as butternut squash soup. The food was absolutely delicious! We also had an array of desserts and wedding cake. Carrie Baker also helped coordinate the ambience of the room and lightening. She even created a lounge area for our guests to relax after dancing and for the children to hang out. The room is very versatile. We were married outside on the premises and the weather was perfect. All of our guests stayed at the premises, as you can rent a wide variety of condos, townhouses, and homes right on site. It was so easy to get ready at the house we rented at Bear Trap and then walk out the door right to the wedding. Our guests were able to travel with their entire family -- including dogs, as many of the rentals are pet-friendly. The following day, Bear Trap Dunes set-up an breakfast for our guests. It was beyond what we expected and extremely tasty. We are so lucky to have had our wedding here. 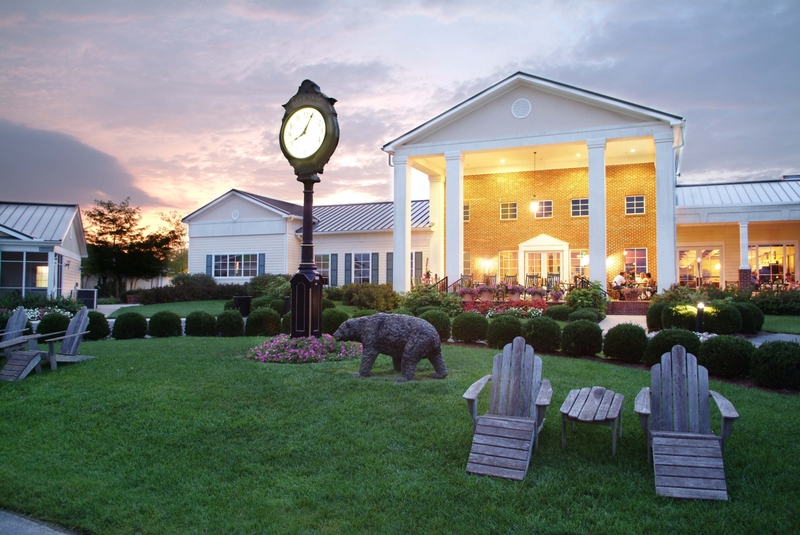 Bear Trap Dunes was our ideal location for our wedding reception. The staff was very attentive. Carrie Baker went above and beyond to make sure we had all the small details covered. She decorated the cake table last minute when the cake stand I bought was not strong enough to hold our cake. It looked fantastic! I did not have to worry at all knowing Carrie was overseeing the venue. Bear Trap rents a tent that connects from the banquet hall. It was unique that dinner was served inside and the dance floor and bar were located outside in the tent. Lighting was provided around the tent ceiling. We didn't need any extra fancy lighting to make the venue look beautiful. The food was delicious- many guests commented on the entrees we chose. Another added benefit of a reception at Bear Trap Dunes is the beautiful golf course in the background. Carrie provided my husband, photographers and I with two golf carts and we drove around the grounds getting pictures. The setting for our photographs were beautiful. 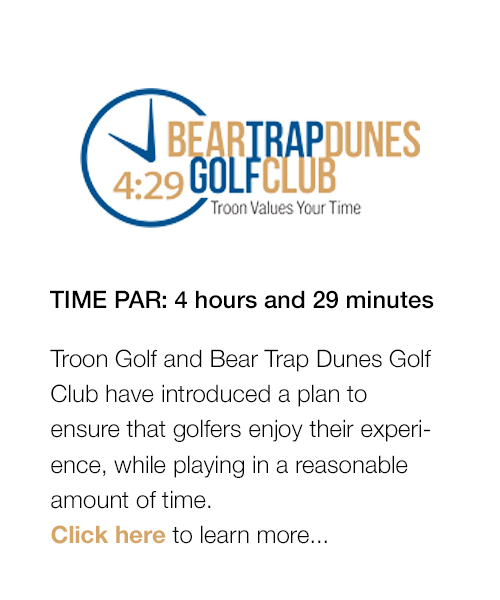 We highly recommend Bear Trap Dunes. We had a lot of great menu options and they were even open to non-menu items if you had something in mind. The chef was great too, our tasting was amazing, and unfortunately we were too busy socializing with our guest to really enjoy our meal the night of. Our guest still rave about how great the food was and it’s almost a year later! We even had gluten free and vegetarian options. We choose to do the buffet style and an open bar. Carrie was also great in the fact that she was able to communicate with all our vendors (DJ, photographers, officiant, etc…) to help them get the information they needed about the facility. The venue price was very reasonable and very beautiful! We had our ceremony outside in the front lawn area. In the back of the venue we set up the dance floor, cocktail bar, photo booth and gift table and our dinner and cake in the banquet room. The venue was also great because so many of our guests were not from the area and were able to rent houses and condos for the weekend of. We even had our rehearsal dinner at a house in the community with all of our friends and family. From the bartenders to the bus boys everyone was very professional and very helpful. The bus boy was even helping the guys with getting their flowers on their suits and bringing drinks to the bride and groom. Thankfully there was no event scheduled the night before ours so we were able to set up the day before, the things that had to be done the day of the great staff took care of. Our big day was perfect thanks to the staff at Bear Trap. If we had to do it over again I wouldn’t change a thing! Thank you again. For some crazy reason I was opposed to having my wedding at a country club and drug my fiancé all over looking for a venue--even after several recommendations to check out Bear Trap Dunes. Boy was I wrong. This stunning facility was absolutely perfect for my ceremony and reception. It was immaculate and gorgeously landscaped. I wouldn't have had to do a thing to make it look amazing. The choices for beautiful pictures were endless. The entire staff had an attention to detail and a genuine enthusiasm for my wedding that is extremely rare. I highly recommend stealing a second with just your groom to watch your reception from outside. The floor to ceiling windows let you see everything and with how quick the time flies, this was an unbelievalbe opportunity to take everything in. My wedding here was romantic, fun, and spectacular in every way (not to mention stress free). All of my guests loved the area too and many stayed right onsite. It was a perfect night that I will never forget. I am extremely thankful that I found such a special place with such special people.